Customize Quick Access Toolbar according to use habit. Add a command to or remove a command from Quick Access Toolbar. The Quick Access Toolbar of Edraw is a customizable toolbar similar with MS Word. It contains a group of commands that are independent of the tab that is currently displayed. You can locate the Quick Access Toolbar in two places, and you can add or delete buttons that represent commands to the Quick Access Toolbar. This toolbar enables I click operation and will save a considerable amount of time. below the Ribbon, which is part of the Edraw user interface. If you don't want the Quick Access Toolbar to be displayed in its current location, you can move it to the other location. If you find that the default location next to the Edraw Button is too far from your work area - the drawing page, you may want to move it closer to your work area to be convenient. From this menu, all commands on the Quick Access Toolbar can be viewed. You can also add a command by checking its title or delete a command by unchecking is title. You can add a command you often use to the Quick Access Toolbar. 1. On the Ribbon, click the appropriate tab or group to display the command that you want to add to the Quick Access Toolbar. 2. Right-click the command, and then click Add to Quick Access Toolbar on the shortcut menu. 1. Right click on the command you want to remove from the quick access toolbar. 2. Choose Remove from Quick Access Toolbar. You cannot increase the size of the buttons representing the commands by an option in Edraw. The only way to increase the size of the buttons is to lower the screen resolution you use. You cannot display the Quick Access Toolbar on multiple lines. 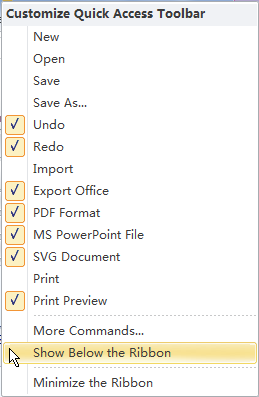 The contents of most lists, such as indent and spacing values and individual styles, which also appear on the Ribbon, cannot be added to the Quick Access Toolbar.